Prague, 17 January – This week marks the 50th anniversary of the self-immolation of Czech student Jan Palach on Wenceslas Square in Prague. 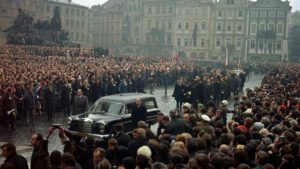 His act was a poltical protest against the apathy in society and the end of the Prague Spring resulting from the 1968 invasion of Czechoslovakia by the Warsaw Pact armies. He set himself alight on 16 January 1969 and died from his injuries three days later in hospital. His death sparked anti-Communist demonstrations and further self-immolations. 20 years later, in January 1989, a series of violently suppressed demonstrations known as Palach Week proved to be a crack that was the beginning of the collapse of the regime in Czechoslovakia a few months later. Various events are taking place this week to mark the 50th anniversary of Palach’s sacrifice and the 30th anniversary of Palach Week. 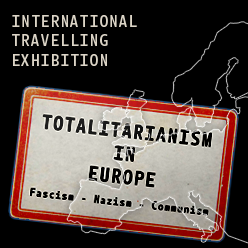 The Institute for the Study of Totalitarian Regimes has launched an outdoor exhibition on Wenceslas Square, mere steps from the spot where Palach carried out his protest. 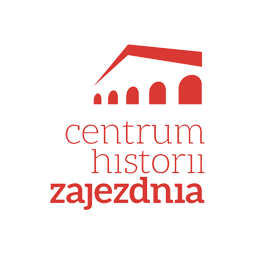 Platform President Łukasz Kamiński spoke today at an international conference held at Charles University in Prague entitled “Jan Palach and Other Living Torches in the Soviet Bloc”. Palach attended Charles University and also the University of Economics in Prague, where a plaque was unveiled this week in his honour.